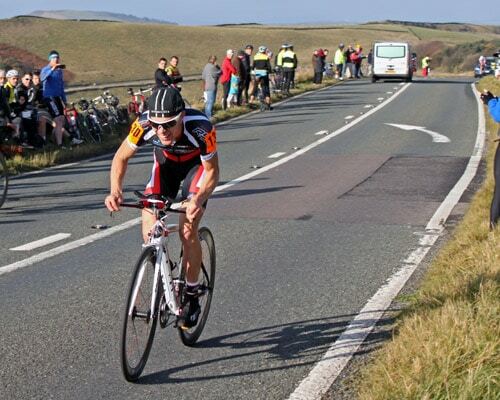 For the past 10 consecutive years, I’ve entered the national hill climb championship. I don’t always prioritise cycling, but the last weekend in October is sacrosanct. It’s the one race, I always want to do. Since taking part in the championship and edging around the podium places, I’ve spent quite a bit of time looking at the (incomplete) list of past winners and podium finishers. (See: Men | Women) A list of winners is the one link with the past – but a list of names only gives you so much. 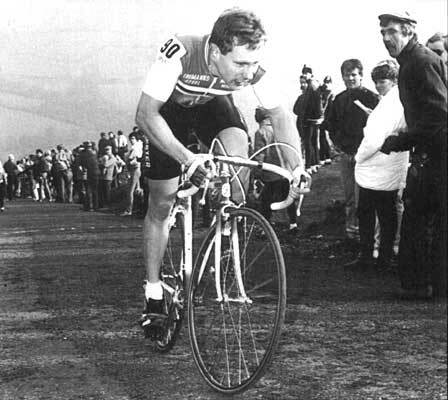 Certainly there are riders like Brian Robinson, Chris Boardman and Malcolm Eliot who need no introduction, but until now people like Frank Worthen and Vic Clark have been nothing more than names in a history book. 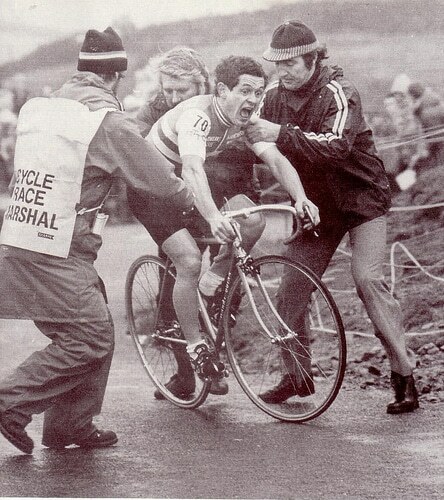 ‘Hill Climb Agony’. Photo by Bernard Thompson. 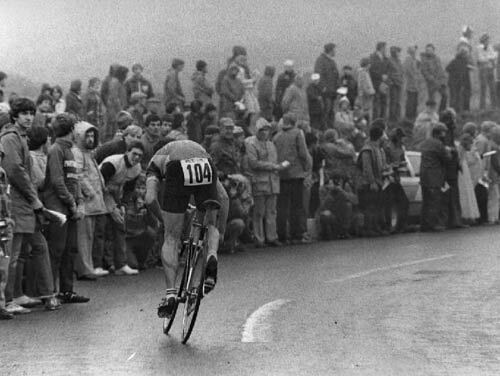 One of my favourite cycling photos of all time. More than anything else, it is interesting to learn about the personalities, characters and differing careers of this very diverse group of people who have won the championship. Even by the standards of British Cycling, I think it’s fair to say it’s a pretty eclectic mix of individuals and personalities; you learn it’s a championship with a very rich history. A championship that means so many different things be it Darryl Webster’s rather reluctant four in a row, to the hill climb specialist who sees it as the highlight of his career. If you feel flummoxed by an avalanche of gear ratios, fear not, it’s far from being a book about the technicalities of hill climbing. PJ climbing Nick ‘O Pendle. 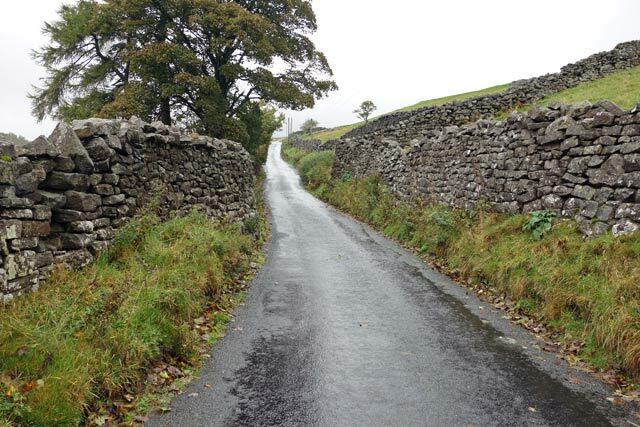 Winnats Pass – the crucible of the championship in the 50s and 60s – alas no longer possible to use. b) It was a more nervous laughter as I smiled over descriptions of my stick insect arms being thinner than my handlebars, to our long rambling conversation which veered from pyramid intervals, to musings on reincarnation and turning up late in woolly socks. PJ definitely doesn’t hold back on sharing his opinions on what constitutes a good and bad hill for the championship. On this issue, I’m more sanguine and less opinionated; I also probably have a vested interest in promoting long hills. Like many things, it’s hard for myself to detach from my very particular interaction with the championship. Admittedly, he’s probably got a good point. It’s hard to deny a city centre, steep closed road makes for a good championship atmosphere. But, I still feel the hill climb championship benefits from having a rich variety of location, length and gradient. You can make your own mind up, but you will be left in no doubt what the author thinks. A curious thing about the hill climb championship is that for many years there was not a separate championship for women. It means that only from 1998 do we really have a history of the women’s event. Auspiciously the first women’s winner was a young Nicole Cook in 1998 (who 10 years later became Olympic road race champion). 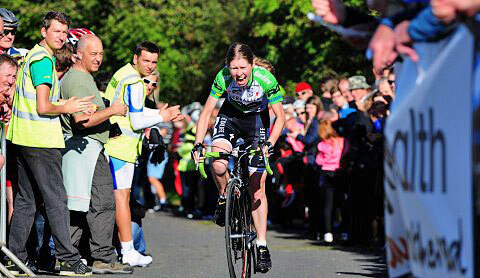 Hopefully, this will prove a propitious start of a new chapter as women move to an equal footing in the prestige of the hill climb championship. PJ devotes a chapter to recent women winners, such as Lyn Hamel and Markya Sennema. It was a good read. PJ is certainly interested in the more transcendent aspects of hill climbing. This is the difficult, hard to articulate aspect of what drives some people deep, deep into the red. It’s a recurring theme of the book – Why can some people drive themselves to oxygen collapse – is there anything about champions that makes them different? What is the attraction to charging up a 25% twisting hill, with wet leaves removing all grip from your real wheel? It’s one of those tricky things which is great to experience for yourself, but notoriously hard to put down into words. Again, PJ’s command of the English language and real understanding of his own hill climb hell / heaven gives a very interesting perspective. It is perhaps a potential pitfall to reach into this aspect of cycling, but I think he pulls it off very well; it requires a certain courage to write a book on cycling and really grapple / ask questions about the more metaphysical forces behind it all. Some may be unmoved by such ideas, but – if nothing else – it is a very thought provoking perspective on cycling. There is obviously a nod to other writers, such as Tim Krabbe e.g. ‘The Ride’, but PJ writes in his own inimitable style – with a conviction of a potentially great cycling writer. It is certainly a unique, distinctive style – somehow quite in harmony with the British hill climb tradition. Once in the flow, it can really take off. I do hope there are more books – lurking under the commitments of family life. It’s hard to get a sense of perspective when you’re so intimately involved in both the championship and the book. Reading my own quotes felt a little strange, and also, a part of me was sub-consciously surprised to see the words were 100% as I said. (cycling magazines often have to cut down quotes or just use the odd sound-bite because of limited space.). If I was writing this book myself, I probably would have been tempted to conservatively edit my own words! But here is the unedited version – coming when the tongue was loosened because of the joy of getting to talk about hill climbs for three hours. Last Nov 2013, I spent a very enjoyable 2-3 hours talking about hill climbs with PJ, and to be honest I could have gone on for longer. It got to the stage where I probably forgot it was a book interview. Still the chapter does a very fair job in sharing some of my main motivations and thoughts on cycling. On a personal note, I do appreciate a lot PJ’s open-mindedness to the spiritual aspect of Sri Chinmoy Cycling Team and my own, perhaps, unorthodox outlook on life. 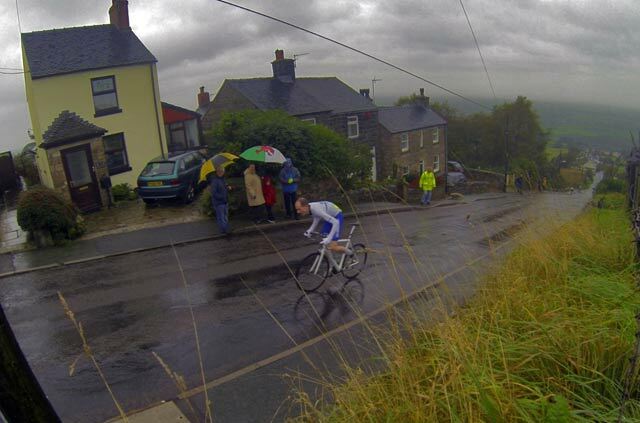 Gunnar Gronlund winning 2011 National Hill Climb Championship on Long Hill. In the book I mention a regret about not using a time trial bike in 2013. This is true as I’m now convinced TT bikes are quicker on 3% hills. But, the only thing I would want to add to my chapter is that I think Gunnar Gronlund was a very worthy and deserving winner of the 2011 Hill climb championship. He was also a very good all-round hill climber finishing 2nd to Jack Pullar on the Rake next year. He timed his form to perfection and on the day was fastest – which is what the championship is all about. An interesting anecdote I remember – shortly after championship I sent a short note to Gunnar to congratulate him on wining. He graciously replied saying it was a shame I didn’t get on the podium because I was one of the best hill climbers of the season. But, 2011 was Gunnar’s year, just like 2012 was Jack Pullar’s year. Fortunately, 2013 was finally one for Tejvan, and it allowed all the near misses to pale into insignificance. I feel slightly embarrassed to feature so prominently when I only won it once. But, perhaps a succession of near misses makes a more interesting story than the seemingly easy dominance of a Daryl Webster. But, if I can shamelessly brag – I can now say I have entered 99 opens entered in the past 10 years (and won 62). There are probably not too many champions with such a percentage of open wins to championships! Perhaps Jeff Wright? 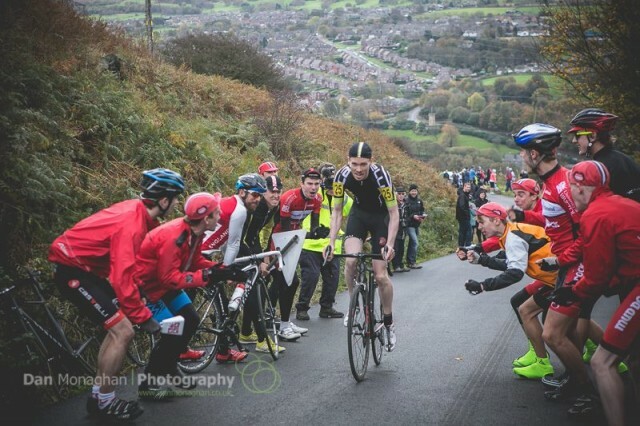 One positive trend of recent years has been an increase in the number of entrants to both open hill climb events and national championships. For the moment, it feels the national hill climb championship is on an upward curve. Although it carries a rather curious place in the cycling world, I have a feeling it will continue to rise in ‘popularity’. Overall, I feel this book is a great service to the history and traditions of the hill climb championship. It gives due acknowledgement to some of the great champions (and also characters) who have put a lot into the sport. I also appreciate the author’s celebrating of the Corinthian nature of the championship – which for me is the real value of any sport. It’s not possible to write an objective review because I’m so involved. 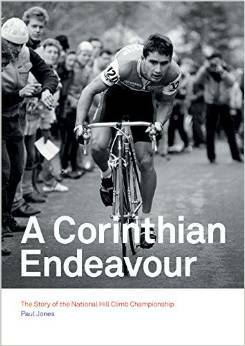 But – I enjoyed reading the book a lot, and I think it would appeal to most people interested in cycling. It’s far from the typical clichés of many cycling books – it’s an eclectic, almost eccentric world with a very interesting perspective on this unique sub-section of British cycling. 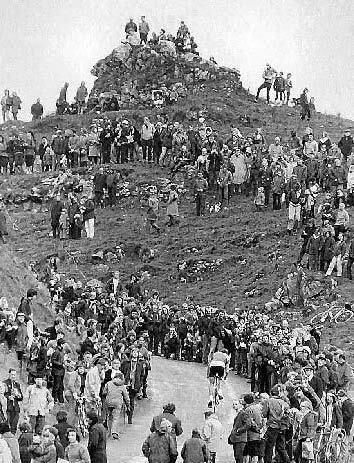 Hill climbs are a very narrow genre of cycling, but the book will have an appeal to a wide audience. 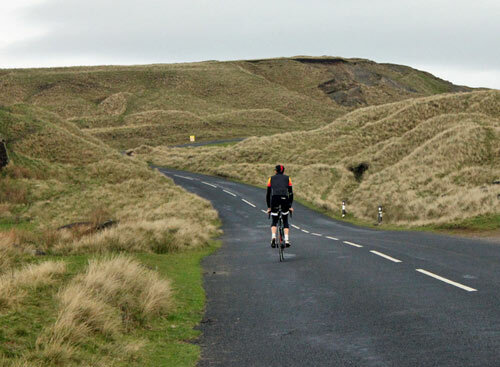 There was a sportive this year that had Winnats Pass closed to traffic for 90 minutes so maybe there is scope for it to be closed for a National Hill Climb again in the future.